The contemporary use of a custom facial implant approach has introduced a whole new method of facial reshaping. The historic use of standard facial implants, while creating their own beneficial changes, by definition are more limited due to their smaller sizes and coverage of less bone surface area. Most patients consider a custom implant approach because they either desire a larger facial area covered, want multiple facial areas to be augmented at the same time or have facial asymmetries that require multiple augmented facial deficiencies. Despite the tremendous benefits that a custom facial implant can offer, there is also some misunderstanding of how they are designed and what they can and can not do. Here are the three misconceptions on this type of facial surgery that bear clarification. It is assumed, albeit erroneously, that a computer designed implant takes into account the overlying soft tissue and how it will respond to what is placed underneath them. The current reality is the computer design process is a bone based approach that currently does NOT and can not take into account the overlying soft tissue effect. One day this will be possible but not currently. Thus any implant design dimensions chosen are based on what the surgeons believes will be the desired external aesthetic outcome. How effective the preoperative design is to the patient’s desired effect is a matter of presurgical education and discussion. 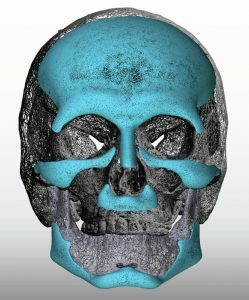 While the use of preoperative computer facial imaging is crucial for implant designing, there is no arithemathic correlation between them. Computer imaging is really a method to determine what type of facial changes the patient is seeking. There is no linear method to know what dimensions an implant needs to have to be able to achieve that effect or if that exact effect is possible. The implant dimensions chosen are a surgical estimate of what is believed to be required to get close to the type of imaged result. 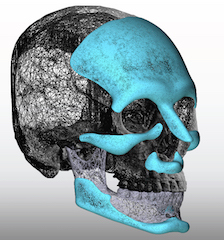 While it is true that the custom facial implant design does have a perfect fit to the bone on the 3D CT scan, it still must be surgically placed. It is not like fitting it to the bone has no overlying soft tissue present. Its placement must be achieved through very small intraoral and external skin incisions where visibility is limited. While the surgeon makes every effort to position it as designed, the design alone does not guarantee perfect implant placement. It is not like placing it on a skeletal model, where visibility to all aspects of its placement can be seen. It is also not a ‘snap fit’ placement. The implant has a smooth inner surface as does the outer surface of the bone. The two do not ‘snap’ into place. They must be aligned visually and then screwed into place to hold the two together in the beloved to be ideal position on the bone.